I’ve been working my way through a couple of Fonseca samplers that I snagged on C-bid, and though I’m wary of cigars that have been repackaged in this way I’ve been quite satisfied this time around. Certainly there have been more hits than misses. One of the better finds is this Anniversary blend, dubbed “Rarissimus”. The CXX Anniversary blend was released in 2011 to commemorate the founding of the Fonseca label in 1891. Francisco Fonseca established his Havana factory that year (or thereabouts) and eventually introduced two innovations still observed by some manufacturers today: he wrapped his cigars in fine Japanese tissue paper (which is still the case with the Cuban Fonseca) and he was the first to release cigars in tubes (tin, at the time). He immigrated to America in 1903 and registered the Fonseca brand name in 1907. The 120th Anniversary line was issued by Quesada’s SAG Imports in a limited release of 120,000 cigars. 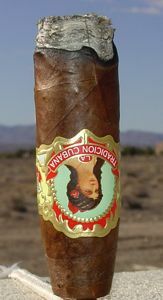 The blend is composed of a Dominican and Nicaraguan filler surrounded by a Dominican binder and finished with a sungrown Dominican wrapper called Habano Vuelta Arriba, a tobacco that is presumably descended from that region in Cuba. I can only imagine what Francisco Fonseca would have thought of a gordo sized cigar. The CXX Anniversary Corona is a rough looking customer with its mottled colorado maduro wrapper and pig-tail cap. The roll is solid, though on the surface it feels a little bumpy and lumpy. The head of the cigar is not particularly elegant, despite its pig-tail, but the cigar draws smoothly and burns beautifully. The ash is firm and a pleasantly dirty gray. This rough looking parejo is not conventionally handsome, but it has character. The Fonseca 120th Anni opens up with a moderate dash of black pepper, but this is quickly overtaken by the complex aroma of the cigar. It reminds me of something like graham cracker, but with more cinnamon. This is a medium-bodied cigar of equally moderate potency. At times the smoke seems a bit thin, but its flavor never wanes. 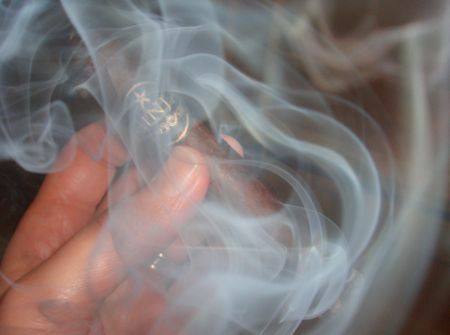 A caramel sweetness appears an inch or two into the cigar, supplanting the cinnamon and balancing out the mildly peppery sensation on the palate. The aroma continues to impress even without a dramatic transition. The cigar settles into earthier territory at the conclusion but otherwise stays the course to its final destination. The Rarissimus is a fitting tribute to the lasting legacy of Francisco Fonseca. True to the Fonseca tradition, it is a fairly mild cigar, but one with sophistication and finesse. Also true to the tradition is the price of this limited edition: around $5 US for the corona. That’s a remarkable price given the quality of the cigar, but that has always been the hallmark of Fonseca. If you appreciate a quality medium-bodied cigar, don’t hesitate. I doubt these will be around for much longer. The folks at the Gurkha Cigar Group were kind enough to send me a few single cigars late last year, and I’m just now getting around to offering my partially considered opinion. I don’t normally review single sticks because there are so many extrinsic factors that can affect a single smoking experience, but these are not particularly subtle cigars so I’m going to take a chance. Just in case, take these quick reviews with a small block of sodium chloride. 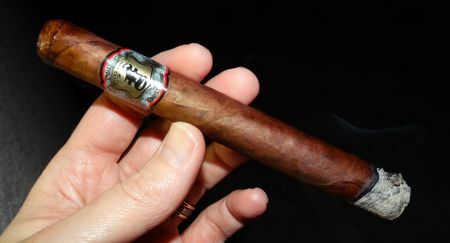 Gurkha’s Ninja (in the robusto and torpedo sizes) was named one of the best bargain cigars of 2011 by Cigar Aficionado. Which reminds me — look soon for Marvin’s new publication, Cheap Cigar Aficionado, featuring an interview with a guy named Jack on his 10-foot aluminum rowboat. Jack sheds no light on Chateau Lafite or Cohiba Behikes in that article, but he has a lot of interesting things to say about Consuegras and nightcrawlers. Anyway. Ninja features an oily black Brazilian maduro wrapper, a Dominican binder, Nicaraguan filler, and a 5 dollar pricetag. To celebrate Gurkha’s quasquicentennial Anniversary the company released this blend in three formulations: two 6 x 60 XOs (gordos), one in Maduro and the other Connecticut shade, and this 6 x 52 toro with a Corojo wrapper. Don’t ask me how the company determined 1887 to be the year that got the ball rolling. As far as I know, the Gurkha Rifles were formed in 1815, so another anniversary opportunity is rapidly approaching. 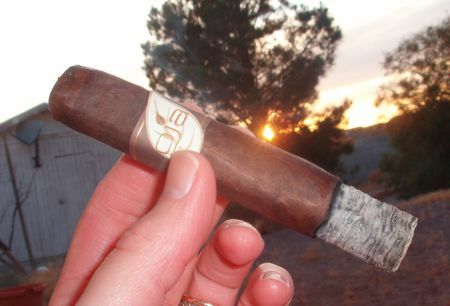 The Maduro XO with a Brazilian wrapper was rated 94 by CA and was awarded ninth place in the Top 25 for 2013. Which is probably why they sent me the Corojo Toro, for which I thank them very kindly. The wrapper variety is the only info I have on blend composition. This Anniversary toro is fine looking cigar with a supple colorado claro wrapper and a triple-wound cap. The draw is excellent and the smoke volume plentiful. It starts out creamy sweet and gradually turns earthy, picking up black pepper along the way. The aroma is oaky with a touch of vanilla. The overall taste is complex and worthy of an Anniversary cigar, as is the asking price: around $13 USD. It’s better than bad, it’s evil. This is branding and marketing stuff, so don’t look for logical consistency here. 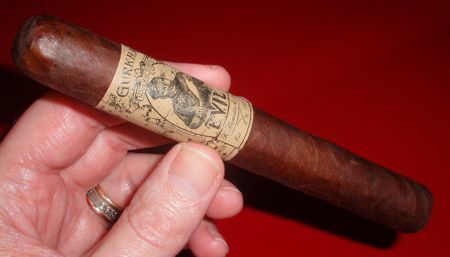 Gurkha is keeping stride with the whole death-metal/goth theme prevalent in cigar branding, and Evil is the natural consequence. This blend features a Brazilian mata fina wrapper, a Dominican binder, and a Nicaraguan core. I smoked the robusto, or most of one anyway. The Evil toro is rustic in appearance, and its demeanor is no less refined. The phrase “pure strength” appears on the band, which is ample warning. It opens up with a friendly greeting, like a used car salesman sidling up to the bar: deceptively smooth though immediately pungent. The base flavors are earthy with a humus-like mushroom quality. The flavors quickly get more serious as leather settles in for the ride and a dose of spicy cayenne tags along. By the mid-point it has become a little too abrasive for me to enjoy, but I can see how lovers of big-time Hondurans might get a bang out of this one. 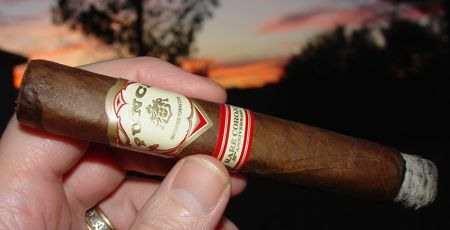 It reminds me a little of the Camacho corojo, and it’s priced in the same general vicinity: around $7 USD. But no cigar brand, no matter how young, is complete without an Anniversary blend. I came across Oja’s Anniversary line a few months ago and after purchasing a pair at the B&M, I decided to let them sit for a while. Sometimes a cigar wants some time to ruminate, and I thought these bad boys with the refined band needed to contemplate existence for a while. The time seems to have served them in good stead. The blend is designed for strength, with a double helping of Nicaraguan ligero in the filler, a Nicaraguan binder, and a Brazilian wrapper of the “Samba” variety. I have never heard of Samba, but whatever it is, I like it. 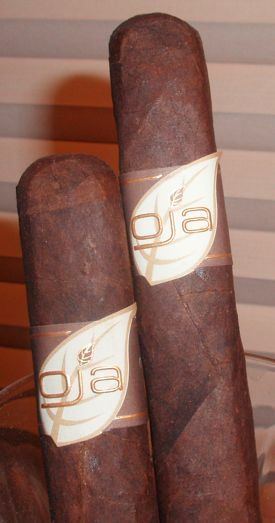 The Oja anniversary Atrevido is a square pressed robusto with a dark and dry wrapper leaf. Brazilian Samba looks a lot like broadleaf maduro, but to me it seems a bit sweeter. The head of the cigar is formed well, but the cap is a little messy. The draw is excellent, and it burns quite evenly, which is notable for a pressed stick. The Oja Anniversary isn’t a cigar that evolves too much, but it is balanced and the flavors are complex enough to keep my interest despite the lack of transition flavors. This cigar offers what I associate with great maduro cigars — rich and earthy flavors on the palate with overtones of chocolate and dark-roasted coffee on the nose. Also present is a woody sweetness that I generally associate with Nicaraguan tobacco. The smoke is slightly tart on the tongue, and a touch of acidity gets the juices flowing. The flavors complement each other nicely and blend well. I was expecting a little more spice in the finale, but it remains pleasantly balanced to the end. Some char and a dash of pepper appear at the end to wave goodbye. I like full-bodied cigars, but I like them especially when the smoke is as creamy and smooth as this one is. A full-bodied cigar, in my opinion, does not have to scorch your tongue off with spice or turn your stomach with nicotine. And the Oja Anniversary does neither, while remaining a substantial and flavorful smoke. It’s not a sophisticated cigar, but it’s finely balanced and tasty. It’s exactly what I look for in a top tier maduro — it’s smooth, with layers of chocolate, dark roasted coffee, and a sweet earthy aroma that makes my garage smell just like… my garage. The bad news? They’re not easy to find, and they’re on the pricey side. MSRP for a box of 20 at Cuban Crafters is $254.99. 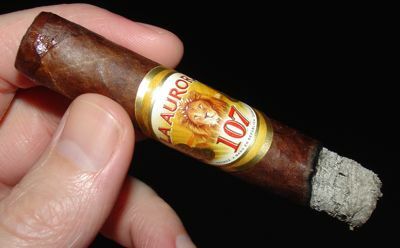 It’s a great cigar, but in the $12-13 range they face some fierce competition. It’s hard to believe the Punch Rare Sumatra has been around for 10 years already. Yes, I know, it’s actually the “Punch Rare Corojo” but I’ve been calling it “Rare Sumatra” for so long that I can’t change now. This is what happens when you get old. As most of us already know, the original Rare Corojo doesn’t utilize a Corojo wrapper at all. It has a lovely colorado-hued Sumatra-seed wrapper grown in Ecuador. So WHY did General Cigar call it Rare Corojo? I haven’t the slightest idea, but like many of the cigar industry’s enduring mysteries it probably comes down to marketing. 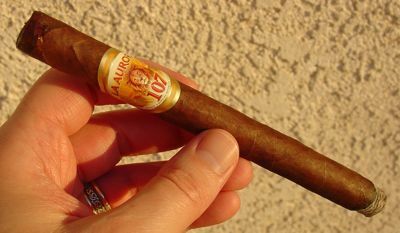 So it’s a bit of a reversal that the Tenth Anniversary edition of the Rare Corojo is not Sumatran — it’s actually corojo! Truth in advertising at last! But wait. It’s an odd sort of corojo: it’s grown in Connecticut. So not only is it actually corojo, it’s also quite rare. Up to this point I’d never heard of Connecticut Corojo. The filler and binder appear to be the same as the Rare Sumatra: the binder is Connecticut Broadleaf, and the filler is a Honduran-Nicaraguan-Dominican blend. And like the original, the 10th Anniversary is rolled in General’s Honduras HATSA facility. Just this one size — a 5 x 50 robusto — has been made in a limited edition. Like the original Rare Sumatra, the 10th Anniversary Rare Corojo is box-pressed, and like most cigars from General it exhibits generally excellent construction. 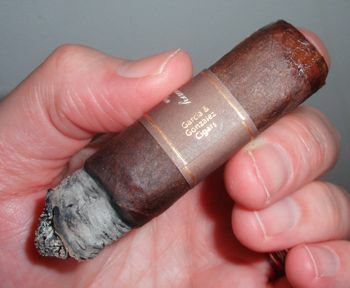 The wrapper is quite dark for a non-broadleaf Connecticut, and it shows some weathering and a few fine veins. The single cap is not really attractive, but it’s functional. The draw is excellent, and it burns perfectly. 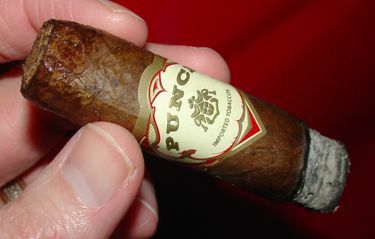 The Punch 10th Anniversary Rare Corojo flares up with a touch of black pepper and a citric edge. The smoke is quite dry and mouth-wateringly acidic. The aroma is mildly spicy and somewhat intriguing. I’m not sure what to make of it because it has the softness of Connecticut shade, but the spiciness of corojo. An odd combination. At the half-way point the smoke is decidedly medium in body and strength. The flavor is woody with overtones of earth and nuts. There is enough tannin here to go around for everyone. All you little taste buds, get in line. Who wants more tannin? The aftertaste is earthy and astringent. The cigar finishes in expected fashion– woody and quite dry — though I found myself primarily concentrating on the sweet and exotically spiced aroma. While I enjoyed the aroma of the Rare Corojo 10th Anniversary and its excellent roll and burn, these didn’t quite balance out the boldly tannic foundation on which the cigar is built. Tannins have a tendency to even out with age though, so this Punch Anniversary blend may just be a diamond in the rough. I didn’t really care for the original Rare Corojo when I first smoked it years ago, but then it grew on me. This cigar may do the same thing. The Punch Rare Corojo 10th Anniversary should be in stores soon, if it isn’t already. MSRP is around $6.50 per stick. Special thanks to General Cigar for sending review samples of this new release. La Tradicion Cubana has been in business for fifteen years, and to celebrate this they have released their 15th Anniversary Deluxe edition. Their last anniversary edition, the tenth, was excellent — they were some of the best cigars in my collection before they mysteriously went up in smoke a couple years ago. LTC remains one of my favorite boutique cigar companies because they produce a quality premium cigar at a really reasonable price. Anyone who has been reading the cigar press and smoking the latest and greatest knows that an exorbitant price does not always mean high quality — sometimes it just means more hype. Fifteen-dollar limited edition cigars are great for the industry, and fun for those who can afford them, but it’s nice that LTC is looking out for the rest of us. I was expecting the 15th Anniversary blend to be similar to the 10th, a blend from several countries with an Ecuadorian wrapper, but it’s a different story this time. 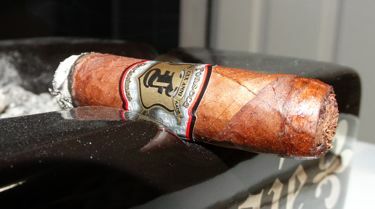 The 15th Anniversary Deluxe is a Dominican puro. Wrapper, binder, filler — all from the Dominican Republic, where LTC cigars are made in Santiago. They might have come up with a better frontmark for the churchill (which is more like a fat toro) but as Juliet once asked, “what’s in a name?” At least they didn’t call it Montague. The wrapper on this 15th Anniversary is gorgeous. This looks like a sun grown wrapper — it’s dark and a little bit rough, and the color is not perfectly consistent, but it has clearly been fermented and processed very carefully. It’s oily enough right out of the cello, but as soon as the cigar is lit and the wrapper warms up, the oils just ooze out. Beautiful. The roll is firm with an easy draw. The large ring gauge and skillful blending result in a slow, cool burn. The robusto and the torpedo smoke for a good hour or more, and the toro (em… the churchill, I mean) went into 90 minute territory. The only construction issue I had with these was a somewhat erratic burn. They didn’t need correction, but the jagged burn line was a touch irksome. More and more it seems that the better the wrapper leaf is, the more eccentric the burn. It must be the prima donna factor. The sustaining note for this blend is coffee, but it’s a note that goes through some interesting modulations. The first third is marked by coffee (of course) and mildly sweet milk chocolate. Beneath this I detected something like roasted nuts. The smoke is medium bodied in texture and very smooth. There is a slightly acidic touch on the tongue and the finish is mild, but dry. The base flavor of coffee and roasted nuts takes on a sweeter edge in the second stage, as caramel comes to the fore and some spicier notes drop on the palate. The finish lengthens a little, bit by bit, but the smoke is still smooth and the aftertaste clean. In the last third the flavors become more concentrated and the coffee-caramel combination starts to taste like a coffee liqueur. There’s also a flavor that mystified me — I couldn’t identify it until I had smoked three or four of these cigars in various shapes, but it finally came to me as I finished off a churchill the other night — I might be crazy, but I think it’s coconut. Toward the band the flavor turns a little charred, as expected, and the nicotine sneaks up. 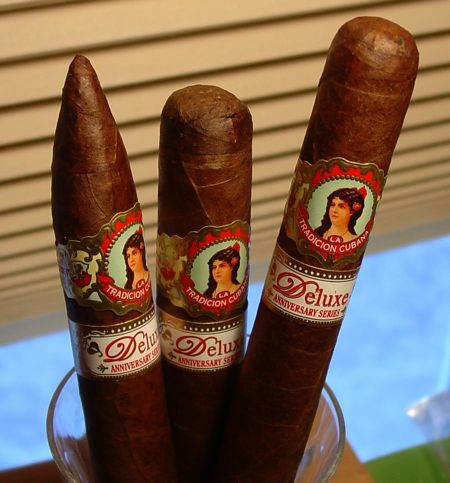 La Tradicion Cubana isn’t known for powerhouse smokes, but they are certainly capable of producing them. Smoke these past the band and you might get a pretty good buzz, depending on your tolerance. This was surprising because they start out so mild and debonair. I’m not sure if i like these better than the 10th Anniversary — it’s such a different blend — but without question the Deluxe 15th is worthy of carrying the Anniversary flag for LTC. If I could have my wish there would be an offering with a smaller ring gauge, but the blend has obviously been very well thought out in these larger sizes. These are slated for release this month, and as I mentioned before, one of the remarkable things about this cigar is its price: boxes of 24 range from 100 USD for the robusto, $110 for the churchill, and $115 for the torpedo. The quality is unbeatable at that price if you like this style of cigar: medium-bodied, smooth, and delicious. Great with coffee. Bring the thermos. Thanks to LTC for giving me a sneak preview of this fantastic smoke!